Every whisky lovers absolute favourite. We take only 16% of the final distillation from the spirit stills to fill into our oak casks. This is the best of the best. This small portion, or ‘cut’, is extraordinarily selective and one of the smallest in the industry. 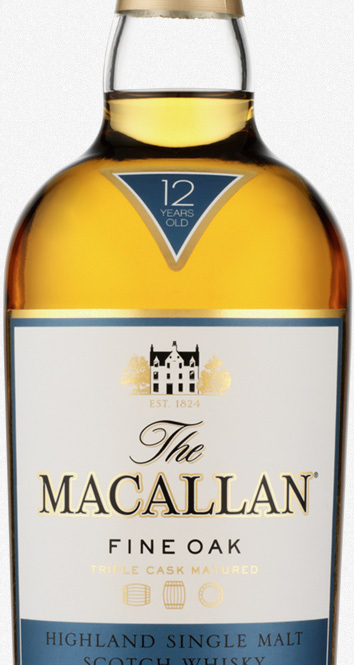 It is a prime reason for the full-bodied richness of The Macallan ‘new make’ spirit. The clear, colourless spirit is collected from the stills at an average 69.8% alcohol by volume. This distinctly robust and characterful ‘new make’ spirit is the starting point for all Macallan. All colour in The Macallan whiskies, bottled by the distillery, is natural. Only the interaction of the ‘new make’ spirit with the oak of the maturation casks delivers the rich and natural diversity of colour throughout the range, from light oak through to darkest mahogany. These natural colours remain ‘fixed’, as opposed to artificial colour which fades relatively quickly in bright sunlight. Great skill is required by the Whisky Maker to achieve consistency of natural colour from bottling to bottling.